To have your Sunshine Week 2019 event included below, please send details and a link or email contact for more information to: sunshineweek@asne.org. If you’d like to see some of what went on in 2013-18, please visit The Vault. This talk, from 2:00pm-3:00pm EST, will provide insight into public domain and open data policies and how they are made. The status of open data policies in the Federal Government is changing with new laws and rulemaking. The White House sees data as Strategic Assets and is directing the Executive Branch to recommend changes that will “create a coordinated approach to Federal data use and management that serves the public.” What are these changes, and how can you affect those changes? Learn about other trends in Government data policies regarding access to statistical data and datasets. Viewers will come away with a better understanding of U.S. Federal policies and laws regarding data. Chicago Headline Club’s annual FOIAFest, a daylong conference dedicated to the Freedom of Information Act, features panels and workshops with leading journalists, attorneys and community groups. From beginners to veterans of FOIA, we’ll help boost your skills to better understand public records and produce more impactful investigations. The conference is from 9:00am-5:00pm CST and costs $20 for Headline Club members, $30 for non-members, and $10 for students. All are welcome! Our system of representative democracy requires active, informed participation by We the People, including professional journalists, in our role as government watchdogs. Our democracy is not a spectator sport. Sunshine Week (March 11-18) provides a unique opportunity to engage students in important lessons about our right to access public records and the dangers of government secrecy. This session will offer participants effective strategies to engage students in learning about NYS Freedom of Information, Open Meetings, and Personal Privacy Protection Laws which benefit all participants in our democracy, if we exercise our right to know. Free instructional resources will be shared. This presentation is scheduled for 3:30 pm. There is a convention admission fee to attend. Join several of the nation’s leading journalism and freedom of information advocates to preview Sunshine Week 2019. Topics will include a look at transparency at the midpoint of the current Presidential term, the privatizing of government under a cloak of secrecy, and, for the first time, a look at court transparency. The event is free and open to the public but requires registration. More details regarding time and location to come soon! From 10:00am-11:30am EDT, join the Pennsylvania Office of Open Records for this in-person training that will focus on Right-to-Know Law issues of importance to requesters. Topics to be covered include how to write a good RTKL request, accessing information in databases, significant deadlines in the RTKL, how to appeal a RTKL denial, and more. From 2:00pm-3:30pm EDT, join the Pennsylvania Office of Open Records in this webinar that will focus on Right-to-Know Law issues of importance to requesters. Topics to be covered include how to write a good RTKL request, accessing information in databases, significant deadlines in the RTKL, how to appeal a RTKL denial, and more. Leading experts and special guests will convene at the National Archives from 1pm- 5:30pm EDT on Monday March 11, 2019, for this special program, during which we will also celebrate the 10-year anniversary of the Office of Government Information Services (OGIS), the Freedom of Information Act Ombudsman. The event is free and open to the public but registration is required. In honor of this year’s Sunshine Week, reporters and the public are invited to a March 11 evening panel discussion to learn how to obtain and improve coverage of climate data. The National Press Club Journalism Institute and the NPC Freedom of the Press Committee have organized a panel of climate science journalists and climate policy researchers to lead this lively discussion. The conversation will take place in the Club’s Murrow Room and go from 6:00 p.m. – 7:30 p.m. Registration is required; tickets are free with RSVP. There will be audience Q&A at the end. Participants will learn: What quality government/academic/privately-produced data sets are available to reporters and how to access the data; How to interrogate scientific data sets, particularly what to look for and red flags if you don’t have a data journalism background; How to evaluate the independence of the scientists/experts they are interviewing and learn who provides their funding. Confirmed speakers include: Elliott Negin, senior writer at the Union of Concerned Scientists; Chelsea Harvey, E&E News climate science reporter (moderator); and Emily Therese Cloyd, director of American Association for the Advancement of Science’s Center for Public Engagement with Science and Technology. The National Press Club is the world’s leading professional organization for journalists and represents more than 3,000 reporters, editors and professional communicators worldwide. The Club’s nonprofit Journalism Institute works to advance press freedom and grow journalism in the public interest. Free to attend. Registration required. From 10:00am-11:00am EDT, join the Pennsylvania Office of Open Records in this webinar that will give new (and relatively new) Agency Open Records Officers a strong working knowledge of the Right-to-Know Law and their duties under the law. At 10:00am, join Arkansas SPJ and the state attorney general’s office for a Freedom of Information Act training, followed by a Q&A session with local journalists. Learn how to use FOIA to access public records and how reporters use the law every day. SPACE IS LIMITED so RSVP at ArkansasSPJ@gmail.com. A $5 donation is suggested at each event to assist with printing costs of the 19th Edition of the Arkansas Freedom of Information Handbook (set to be revised October 2019). A joint effort by the Arkansas Press Association, the Governor of Arkansas, the Attorney General of Arkansas, the Arkansas Pro chapter of the Society of Professional Journalists and other organizations, the Handbook is the state’s definitive and most up-to-date resource on the FOIA. This webinar, put on by the Office of Open Records, will present the results of the OOR’s 2019 survey of Agency Open Records Officers. The goal of the survey was to gather data related to Right-to-Know Law (RTKL) requests submitted in calendar year 2018 to help inform future policy decisions regarding the RTKL and other government transparency issues in Pennsylvania. This webinar will be from 2:00pm-3:00pm EDT. Celebrate Sunshine Week the evening of March 12 with the Colorado Freedom of Information Coalition, the Colorado Media Project, the Colorado Press Association and the Colorado Society of Professional Journalists and pick up a hot-off-the-presses copy of CFOIC’s updated, revised and much improved 2019 guide to Colorado’s sunshine laws. Mingle with journalists who will answer your questions about getting information from your government. And try your hand at CORA trivia!!!! The first round is on the Colorado Media Project! PS: RSVP ASAP, as space is limited! This event will be from 5:30pm-7:00pm MDT. Letting the Sunshine In: A look back at the 10-year history of the Right To Know Law and a glimpse of the future. Legal and policy experts, and veteran journalists assess the issues with public records law. This complimentary event, put on by The Caucus, will host a reception from 5:30pm-6:00pm and follow up with a panel discussion and Q&A from 6:00pm-7:30pm. Panelists will address legal challenges and successes, process guidelines, and tips for users. You’ll hear from lawyers familiar with the law, reporters who use it virtually every day, and officials who render judgment on agency appeals. Don’t miss this frank discussion of the law’s shortcomings and what can be done about them. Invited guests include representatives from law firms that file lawsuits for records, reporters who file requests and battle bureaucracies, the state’s current and former directors of the Office of Open Records, champions of the law in the General Assembly, as well as a leading public policy professor offering an academic perspective. Email Tricia Greyshock by March 8 to RSVP. Transparency and access to information are essential to a functioning democracy. But science and science professionals have been under relentless assault during the Trump administration, compromising both the public’s right to know and Congress’s duty to conduct effective oversight. Censorship of research, efforts to limit the communication of federal employees and contractors and reprisal against employees who blow the whistle on serious abuses are just some of the tactics that cast a shadow on truth. This Sunshine Week event will include discussions with journalists and presentations by civil society members that explore the ongoing assaults on science and offer resources to help journalists, public interest organizations, employees, and policymakers promote accountability, protect scientific integrity, and restore public trust in government. Join us to network with professionals committed to scientific integrity, free speech, and government transparency. This 6:00pm-8:00pm event, presented by Government Accountability Project, Union of Concerned Scientists, & the Sunlight Foundation, is free and open to the public. The event moderator is Michael Halpern, Deputy Director, Center for Science and Democracy, Union of Concerned Scientists; the featured speakers include Emily Holden, Environment Reporter, The Guardian; Lisa Friedman, Climate Change and Energy Reporter, The New York Times; and Annie Snider, Energy Reporter, POLITICO. Additional presentations by Liz Borkowski, Managing Director, Jacobs Institute of Women’s Health Department of Health Policy and Management, Milken Institute School of Public Health, The George Washington University (discussing assaults on science documented in new coalition report, Protecting Science at Federal Agencies: How Congress Can Help); Dana Gold, Senior Counsel & Director of Education, Government Accountability Project (discussing role of science whistleblowers in promoting transparency and accountability, government efforts to chill employee speech, and sharing resources for federal employees & contractors, journalists and public interest organizations on whistleblowing); and Rachel Bergman, Web Integrity Project Director, Sunlight Foundation (discussing information censorship & demonstrating new Website Tracker Tool used to help track shifts in public information, access to Web resources, and changes in stated policies and priorities on government websites). Food and refreshments will be provided. RSVP here. The DC Open Government Coalition will be partnering with other local organizations on its 8th annual Open Government Summit. The summit will be held at the American Bar Association (1050 Connecticut Ave., NW) on the evening of Tuesday, March 12th and promises a lively discussion about the state of transparency in the District of Columbia. The event is free, but registration is required. “Thank a Journalist Day” will recognize the work that journalists do to empower their communities around the world. Governor Eric Holcomb (Ind.) 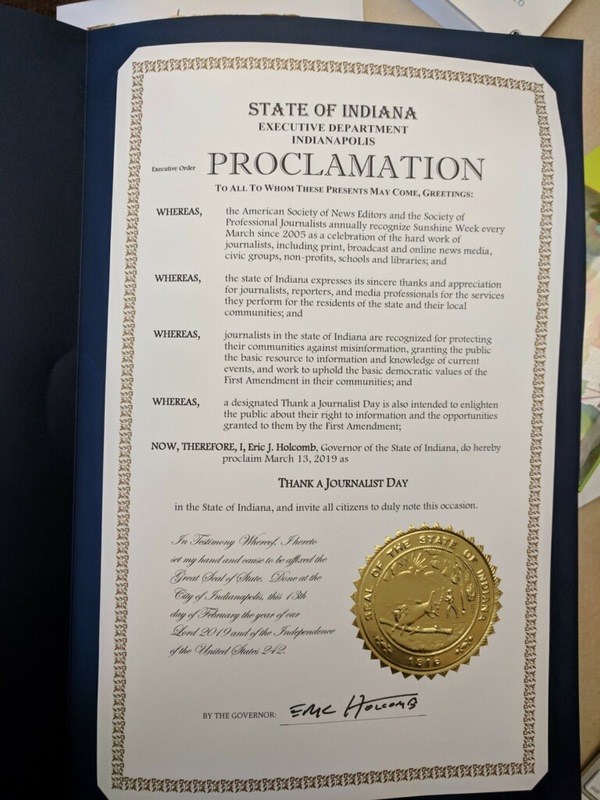 has proclaimed March 13 as “Thank a Journalist Day.” “Thank a Journalist Day” acknowledges the important role that journalists play in keeping communities informed and safe. From stories on hometown heroes to breaking national news, without their work, there would be no news. On March 13, individuals across the globe will be asked to thank a journalist and media outlets on Facebook and Twitter using the hashtag, #thankajournalist. “We have thanked firefighters, police officers and teachers who are all vital to the community,” said Michelle O’Malley, a lecturer of journalism at Ball State University, Muncie, Indiana. “However, we might never know about where the fire was, or who was burglarized, or won the ball game or received all A’s, if it weren’t for journalists. Journalists are an important part of every community’s fabric and today is a good day to thank them for doing this very important job.” More than 100,000 media outlets across the United States provide communities with news that supports everyday life. It’s time to thank them for providing us with the truth, and protecting free speech and democracy, O’Malley said. Students behind the project are Alissa Brewer, Michaela Dean, Claire Demirjian, Eddie Metzger, Kelli Reutman and Jillian Wilschke. They are guided by their adviser O’Malley. This webinar, put on by the Office of Open Records, will focus on Pennsylvania’s Sunshine Act, which governs access to government agency meetings in Pennsylvania. Topics to be covered include the definitions of agency business and official action, when executive sessions may be held, recording public meetings, penalties for violating the Sunshine Act, and more. This webinar will be from 10:00am-11:00am EDT. From 2:00pm-3:00pm EDT, join the Pennsylvania Office of Open Records in this session that will cover the OOR’s mediation program, which has proven to be effective and can be used by both agencies and requesters to help resolve disputes under the Right-to-Know Law. Topics to be covered include how to request mediation, the process of mediation, what happens if mediation fails, and more. The Electronic Municipal Market Access (EMMA®) website provides free access to detailed information about the finances of states, cities and counties, as well as many hospitals, universities, stadiums and other ventures financed by public debt. Staff from the Municipal Securities Rulemaking Board, which operates EMMA, will demonstrate how to find data and information—from public finance credit ratings to comprehensive annual financial reports. This webcast will also highlight several EMMA tools and resources that can assist the public with monitoring the economic and financial health of their communities. This webinar, put on by the Municipal Securities Rulemaking Board, will be from 3:00pm-4:00pm EST. This webinar, put on by the Office of Open Records, will highlight recent, significant court decisions and final determinations issued by the OOR. This webinar will be from 10:00am-11:00am EDT. This webinar, put on by the Office of Open Records, will give Agency Open Records Officers (AOROs) and agency solicitors the information they need to prepare appropriate affidavits when a Right-to-Know Law appeal has been filed with the OOR. Typically, evidence is submitted to the OOR via affidavit, so it’s important for AOROs and solicitors to be familiar with what constitutes a good affidavit under the RTKL. This webinar will be from 2:00pm-3:00pm EDT. From 5:30pm-8:00pm, meet the POGO team and enjoy light refreshments and hors d’oeuvres. 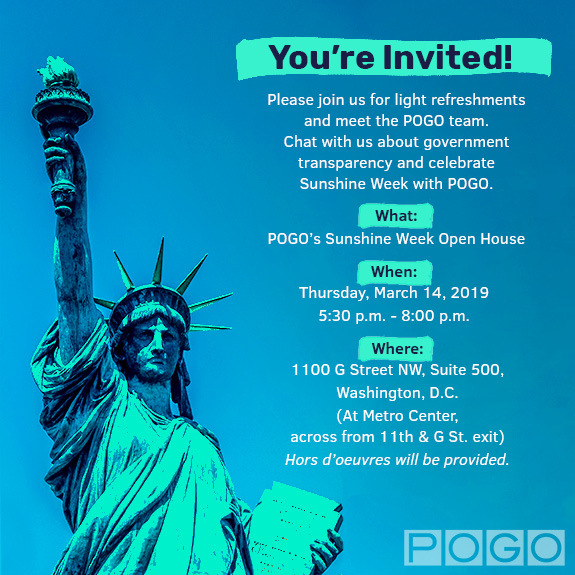 Chat with us about government transparency and celebrate Sunshine Week with POGO. At 6:00pm, grab a brew and a slice while we test your knowledge of the state’s FOIA history and regulations with a fun twist, of course. A $5 donation is suggested at each event to assist with printing costs of the 19th Edition of the Arkansas Freedom of Information Handbook (set to be revised October 2019). A joint effort by the Arkansas Press Association, the Governor of Arkansas, the Attorney General of Arkansas, the Arkansas Pro chapter of the Society of Professional Journalists and other organizations, the Handbook is the state’s definitive and most up-to-date resource on the FOIA. From 10:00am-11:00am EDT, join the Pennsylvania Office of Open Records in this webinar that will feature highlights from the 2018 OOR Annual Report, which will be released concurrent with the start of the webinar. The OOR’s Annual Report includes data about Right-to-Know Law (RTKL) appeals, examples of successful RTKL requests, and more. Stay up to date and prepared. Don’t miss this helpful legal training for newsrooms! The Sunshine Act might not have changed, but it’s always valuable for reporters and editors to revisit the law. This session will cover definitions, procedures, violations and remedies for violations. We’ll touch on public comment, recording, executive sessions and other issues that frequently challenge your coverage. Melissa Melewsky, PNA’s Media Law Counsel, offers invaluable information, advice and examples. Most appropriate for editorial staffs, especially newcomers and those desiring a refresher course. This one-hour webinar is scheduled to begin promptly at 12 noon. Cost is just $10 per login for PNA members; $20 for non-members. Registrants must have both a computer and phone in order to participate. Gather your newsroom together in one room and have lunch and learn! Still only $10 with no limit on the number participating. To register, email foundation@pa-news.org or phone (717) 703-3012. Participation instructions will be emailed one to two days before the session. The Fairfax County Government’s Office of Public Affairs FOIA Team would like to invite Virginia FOIA officers and interested colleagues, to Virginia Freedom of Information Act (VFOIA) training offered by Alan Gernhardt, Executive Director of the Virginia FOIA Council. This training, from 10:00am-12:00pm EDT, will cover access to public records, including emails, navigating the balance between transparency and privacy, and FOIA fees. Please note that this training counts towards CLE credits. (Fairfax County employees are asked to sign up for this training via Fairfax County’s EmployeeU.) Questions? Please e-mail FOIA@fairfaxcounty.gov! From 2:00pm-3:00pm EDT, join the Pennsylvania Office of Open Records in this session that will introduce participants to the many resources available at the OOR’s website for both agencies and requesters. The website includes guides for citizens and agencies, many sample forms, a powerful Final Determination search tool, and much more. This panel, beginning at 2:00pm, will feature members of local police departments and professional journalists on public information, transparency, crime, community policing and how media and police work with each other. A $5 donation is suggested at each event to assist with printing costs of the 19th Edition of the Arkansas Freedom of Information Handbook (set to be revised October 2019). A joint effort by the Arkansas Press Association, the Governor of Arkansas, the Attorney General of Arkansas, the Arkansas Pro chapter of the Society of Professional Journalists and other organizations, the Handbook is the state’s definitive and most up-to-date resource on the FOIA. Meet the activists and get the skinny. Kochs Off Campus! will reveal newly obtained documents describing the UA Freedom Center’s project to spread the creed of privatization on behalf of billionaire donors. KOC! will update the community on UA’s review of the Freedom Center and announce two new campaigns. Merrill Eisenberg will update us on re-launching Arizona’s Outlaw Dirty Money initiative. This event begins at 4:00pm; doors open at 3:30pm. On Monday, March 18 from 10 a.m. to noon, the National Press Club Journalism Institute will host a workshop in the National Press Club’s Bloomberg Room on campaign finance for political reporters and other journalists who don’t usually cover finance but will be writing about it during the 2020 election. Registration required to attend. Tickets ($5 for NPC Club members and $10 for the general public) can be purchased here. This hands-on program will answer these questions: Is it illegal? How to spot problems with candidate funding, political parties and outside groups; What’s the follow-up question? How to fact-check and use campaign fundraising numbers without being used; What are voters most concerned about? How to highlight influence buying and “the company you keep”; What did we see in 2016 that should worry us in 2020? How to identify the likeliest campaign finance issues and focus on the numbers that matter. The workshop will include an interactive deep dive into OpenSecrets.org and the data sets there, as well as the FEC website and other campaign finance databases. Bring your laptop and your questions to get the most out of the workshop. Confirmed speakers include Ellen Weintraub, Chairwoman and Commissioner, Federal Election Commission; Paul S. Ryan, Vice President, Policy & Litigation, Common Cause; Anita Kumar, White House Correspondent and Associate Editor, Politico; and Sheila Krumholz, Executive Director and former Research Director, Center for Responsive Politics. Contact Julie Moos, executive director of the National Journalism Institute, with any questions at jmoos@press.org. Since 2005, the American Society of News Editors has hosted Sunshine Week to highlight the importance of transparency in a free society. In 2019, our second Demystifying Democracy event will focus on the importance of open government and will be co-hosted by ACCESS/RI, RI ACLU, League of Women Voters of RI, and the New England First Amendment Coalition. Moderated by Edward Fitzpatrick, formerly of the Providence Journal the panel will include Dan McGowan of WPRI, Ethan Shorey of The Valley Breeze and Amanda Milkovits of the Providene Journal. It will be an in-depth discussion of how Rhode Island’s public records and open meetings laws can be used to hold government accountable. This event is 10:30am-12:00pm EST.